Nen Daiko's song Satori no Michi means "The Road to Enlightenment." 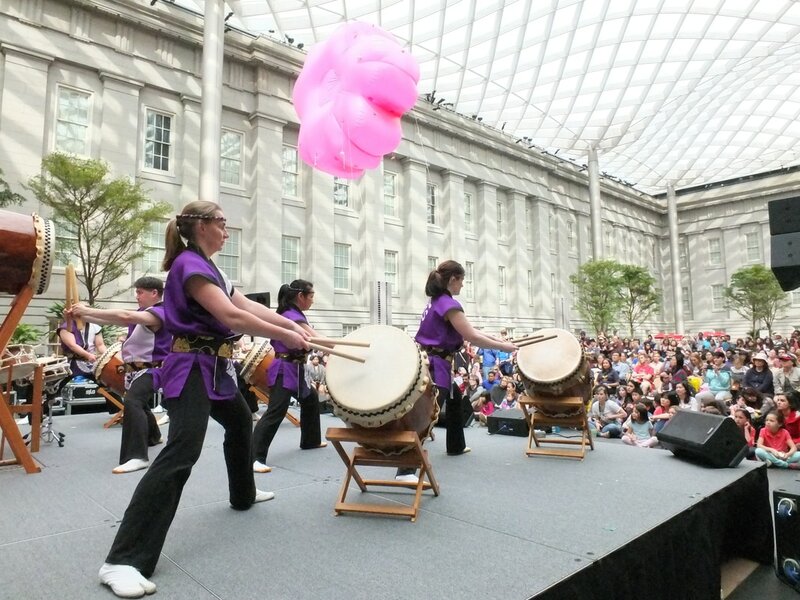 The visual centerpiece of the song is the odaiko or largest drum. It is on an upright stand with the head facing the audience. The deep resounding sounds of the odaiko represent the Buddha. 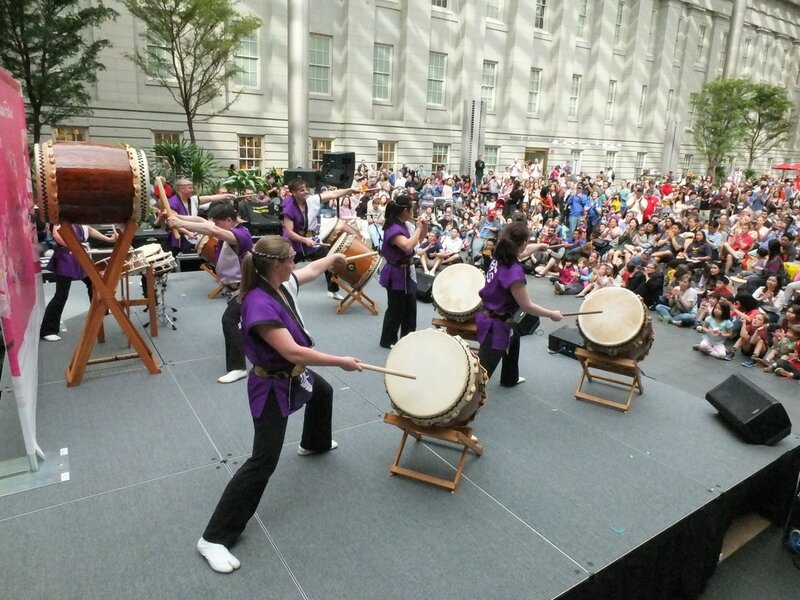 The chu-daiko (medium-sized drums) represent people trying to find the path to enlightenment. Ruth Vines played with Nen Daiko from 1994-2007. In 2007, she was inspired to write Satori no Michi because she was leaving the area and Nen Daiko. She wanted to express her strong feelings about Nen Daiko and Ekoji Buddhist Temple. "The first thing that came to me was the melody line for the fue," says Ruth. "I wanted the song to give the sense of being grounded and free at the same time." In the middle of the song, many drummers play solos. Ruth says this represents how everyone has their own journey. "Everybody has their own energy and movements that they bring into the solos that are unique to them," she says. "It is similar how everyone has their own questions or doubts." Ruth says the format of the song was inspired by Omiyage, a well-known song in the taiko world that was written as a gift to all taiko groups. The word omiyage means "gift." Satori no Michi is similar in that each instrument has a unique voice that blends together into a multi-layered song. While Ruth wrote most of the parts, Greg Nakamura wrote the part for the set of shime or rope drums. Ruth says she told him she needed enough music to fill a certain number of measures, and he would improvise. Over time, his playing became consistent so the shime part now sounds similar from one performance to another. At many performances in the intro, there is an unusual instrument played called the vibraslap. This instrument is best known for songs about cowboys and the Wild West because it sounds like a rattlesnake shaking its tail. 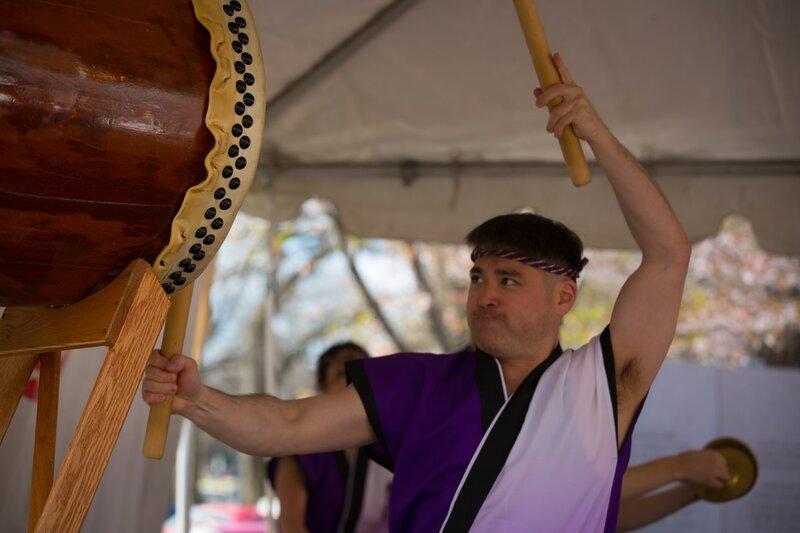 When the chu-daiko start to play, their part begins with a quick tapping sound on the edge of the drum. This beat is called "horse beat" because it sounds like the rhythm of a horse's hooves. 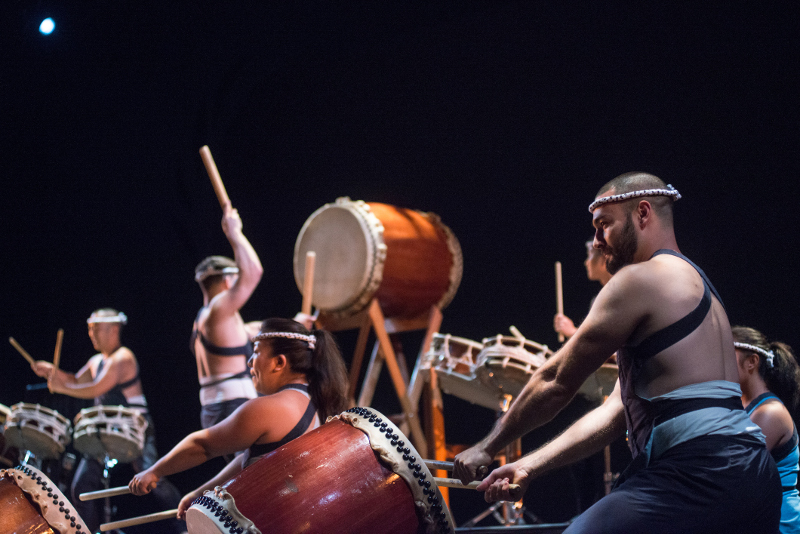 The drummers aim to make the sound even across all the chu-daiko. The first drummer sets the volume for the rest. 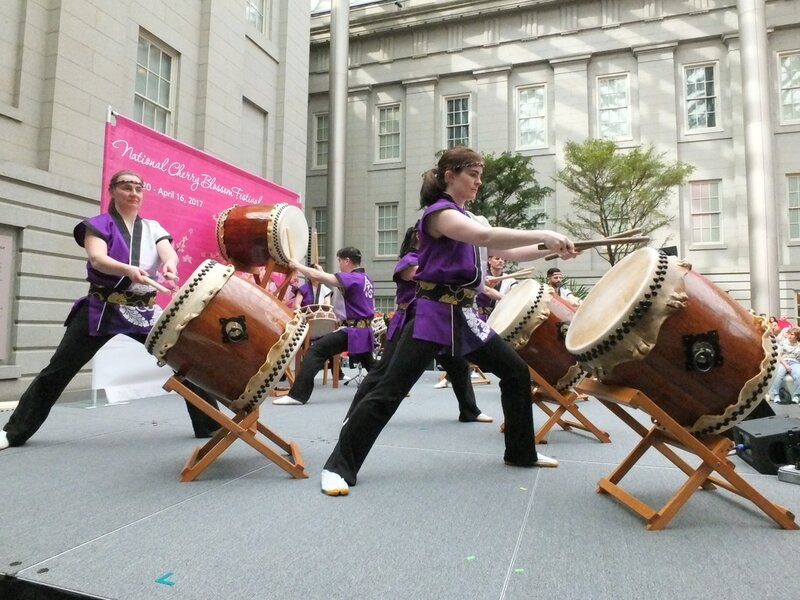 Nen Daiko has adjusted the number of drums in the song through the years. At some performances, particularly those at Ekoji Buddhist Temple, the song starts with the first part of the Buddhist chant Shoshinge. 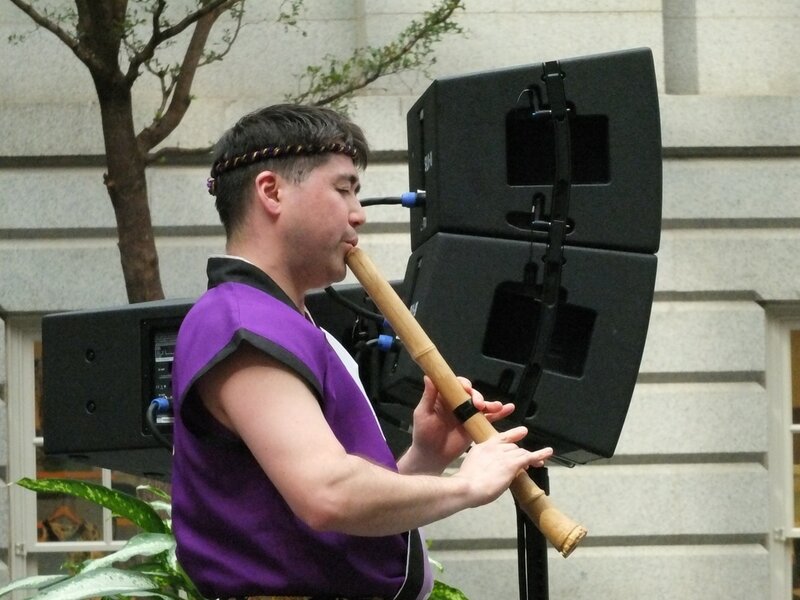 More than once, the group has played it during a windy day, which can be very difficult for those playing fue or shakuhachi. On more than one occasion when the flutes were supposed to provide a dramatic start to the song, the wind was so strong that no sound would come out of the flutes. 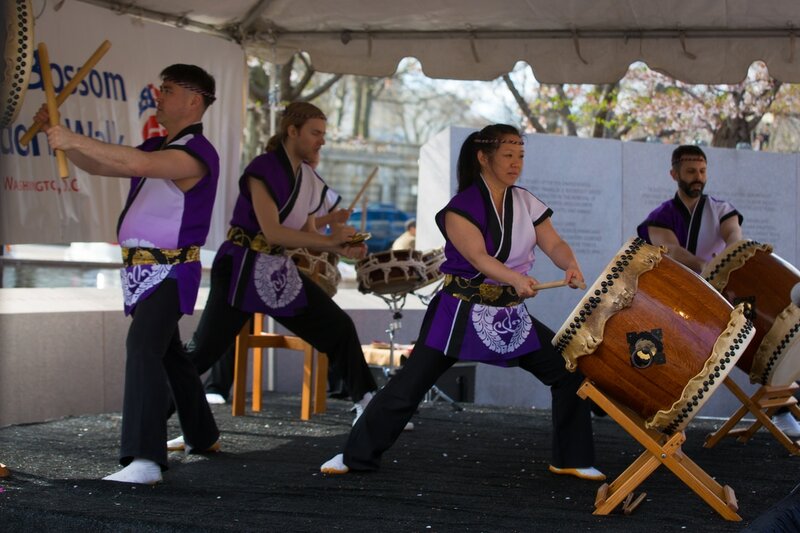 In 2015, Nen Daiko played Satori no Michi at the Cherry Blossom festival with calligraphy artist Yoshino Bien who did a live calligraphy painting during the song. Here's one of our most memorable Satori no Michi performances, as part of our 20th Anniversary concert, In Gratitude, in August 2014. It begins with a chant often sung at the beginning of Jodo Shinshu services to welcome the Buddha into the space. The fue players each represent the three taiko groups at the performance - Nen Daiko, Soh Daiko and Hoh Daiko, showing how these sister groups support each other and came together for this performance. This video shows the first half of the song to give a flavor of Satori no Michi. Come to an in-person performance to see the full song! Video from Taiko Jam 2017 - Thank you to the volunteers with the Taiko Community Alliance led by Benjamin Pachter for taking this video. ​This video shows the last minute of the song to give a flavor of Satori no Michi. Come to a performance to see the full song!